Bariatric surgery is gaining acceptance as a ‘metabolic surgical intervention’ for patients with type 2 diabetes. The optimal form of surgery and the mechanism of action of these procedures are much debated. We compared two bariatric procedures for obese patients with type 2 diabetes and evaluated their effects on HbA1c and glucose tolerance. We performed a parallel un-blinded randomised trial of Roux-en-Y gastric bypass (RYGB) vs sleeve gastrectomy (SG) in 41 obese patients with type 2 diabetes, who were bariatric surgery candidates attending the obesity clinic. 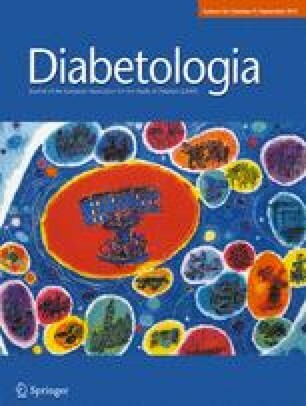 HbA1c, body composition and glucose tolerance were evaluated at baseline, and at 3 and 12 months. Of the 41 patients, 37 completed the follow-up (19 RYGB, 18 SG). Both groups had similar baseline anthropometric and biochemical measures, and showed comparable weight loss and fat:fat-free mass ratio changes at 12 months. A similar normalisation of HbA1c levels was observed as early as 3 months post-surgery (6.37 ± 0.71% vs 6.23 ± 0.69% for RYGB vs SG respectively, p < 0.001 in both groups for baseline vs follow-up). In this study, RYGB did not have a superior effect in comparison to SG with regard to HbA1c levels or weight loss during 12 months of follow-up. This work was supported by grant no. 3-000-8480 from the Israel Ministry of Health Chief Scientist, the Stephen Morse Diabetes Research Foundation and by Johnson & Johnson. The online version of this article (doi: 10.1007/s00125-013-2965-2) contains peer-reviewed but unedited supplementary material, which is available to authorised users. We wish to thank our patients for their time and efforts while participating in this study. This study was partly funded by research grants from the Israel Ministry of Health Chief Scientist (to RW), the Stephen Morse Diabetes Research Foundation (to RW) and Johnson & Johnson (to AK). AK and KJH acquired the data, analysed it and wrote the manuscript. LM, CS, LH, NB and AsK took part in the clinical care and the interpretation of the analysis, and also reviewed the manuscript. RW designed the study, acquired and analysed the data, and wrote the manuscript. All authors reviewed and approved the final version of the manuscript.